After a few weeks hiatus due to technical difficulties, we’re back in business with the fly tying videos. You could fish an Adams Parachute 12 months a year in Oregon — passing for tiny BWOs in the winter to giant Gray Drakes on the Upper McKenzie in late summer. In this fly tying video, Barrett shows you how to tie this classic fly pattern for fishability and durability. The great thing about the Adams is that it can still pretty much be whatever we want it to be. Charles Adams himself thought it imitated an ant. Biologist-angler Sid Gordon, writing in 1955, spoke for generations of anglers before and since when he said that if you slanted the wings back a little you could “go any place in the country and have a common-place, staple imitation of the caddis in just this one pattern.” The Adam fills in for everything. At need, I’ve used it as a midge, a PMD, a Hendrickson, and a dozen other things I didn’t know what to call. We all recognize an Adams hatch when we see one. 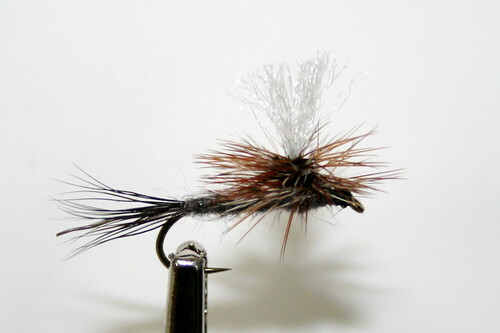 I omit the tail sometimes when fishing it as a small caddis.